Bloom's taxonomy and Depth of Knowledge are two popular conceptual learning frameworks. They both approach the learning process from relatively different stands:Bloom's taxonomy seem to emphasize the categorization of tasks in a way that corresponds with students thinking levels ( e,g knowing, understanding, applying, analyzing, synthesizing, and evaluating). Depth of Knowledge (DOK), on the hand, shifts the focus from the product or end result to focusing on the cognitive and thinking process. It extends beyond the what and digs deeper into the how. 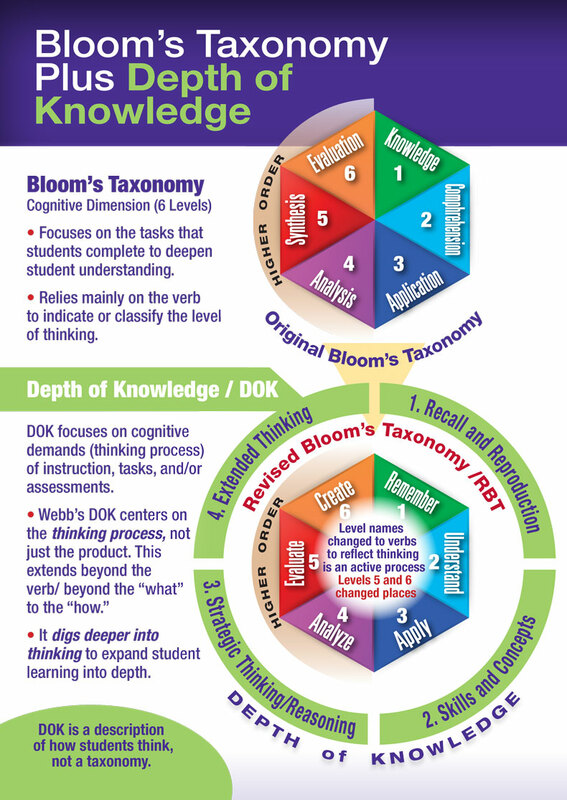 Here is a beautiful visual I came across today on this Pinterest board and which illustrates the difference between Blooms' taxonomy and Depth of Knowledge. Mentoring Minds provides a free downloadable version of this graphic from this page.